When our nails look good, we are pretty satisfied with ourselves. However, strong, healthy-looking nails aren’t only important for our self-esteem but for our overall well being, too. In case you weren’t aware, certain nail symptoms can point to a number of health problems. While some nail conditions could be signs of more serious problems, others aren’t a reason for concern. Keep reading to find out all about common nail symptoms and learn which ones you should and shouldn’t ignore. There is a number of reasons why our nails might turn yellow. The first one is our age; as we grow old, our nails might naturally become yellow, which shouldn’t worry us. Also, if we frequently go to nail salons to get acrylic nails done, or we regularly apply nail polish at home, that can cause the yellowing. In that case, we should take a break and let our nails recover. Smoking and fungal infections are also possible causes of yellow nails. Lastly, in rare cases, yellow nails can point to serious conditions such as thyroid disease, diabetes, psoriasis, or lung disease. White spots are very common; everyone has had them at least a couple of times in their lives. While many people believe that these spots indicate calcium deficiency, that isn’t exactly the case. In reality, these white spots don’t point to any deeper problem; they are simply a result of minor trauma. For example, if we hit our finger against something hard, such as a piece of furniture, we may end up with these spots. While yellow nails don’t necessarily have to be a reason for concern, bluish nails can point to a serious problem. If we notice that our nails have a bluish tint, our body might not be getting enough oxygen. Further, that could mean we are having a lung-related disease, such as emphysema. Also, certain heart problems can cause our nails to appear bluish. If we’re experiencing brittle nails that often split or crack, our nail plate could be very dry. 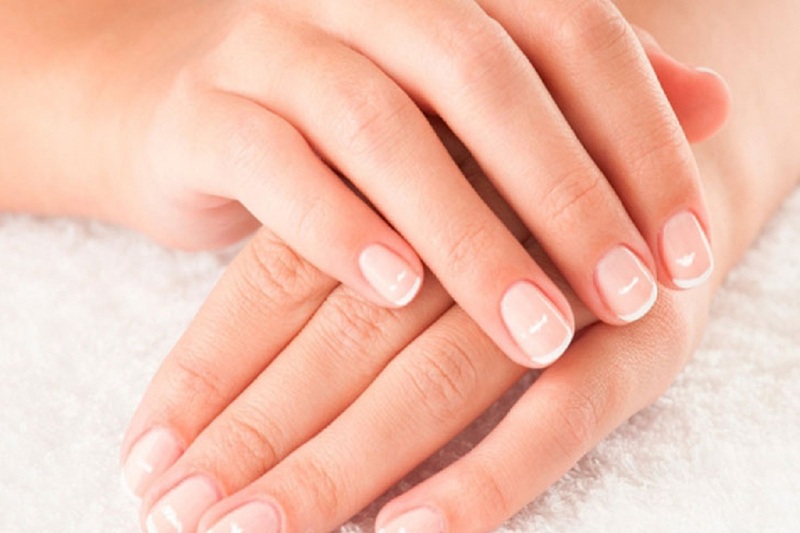 Those nail symptoms have been linked to thyroid disease. However, if the splitting and cracking are accompanied by a yellow hue, we might only have a fungal infection. Also, if our nails are brittle and soft, the dryness could be caused by our lifestyle or the environment. Using too much nail polish remover, swimming frequently, washing the dishes without gloves, using a lot of cleaning products, or living in a non-humid area can dry out our nails, making them brittle. We can help our nails recover by providing sufficient moisture; lotions containing hyaluronic acid, Shea butter, or glycerin can do wonders. If the problem is ongoing, we should see a specialist. Vertical ridges on our nails shouldn’t worry us; those are normal aging signs. Just like we get wrinkles on our face, we get them on our nails, too. If we notice side to side ridges on one of our nails, that’s probably the result of direct trauma. However, if the ridges appear on multiple nails, that could point to a more serious illness. When our body is fighting a disease, it tends to save energy primarily for that task. Thus, it has no time to take care of our nails. If we notice dark lines under our nail, we shouldn’t postpone visiting our doctor. The most dangerous type of skin cancer, melanoma, can cause these lines. Also, a painful growth on the nail could indicate the same. Melanoma coming from our nail is very serious, so we should have that inspected as soon as possible. Very pale, thin, and concave-shaped nails can point to an iron deficiency anemia — a condition that can be treated with iron supplements. So, if you are experiencing these nail symptoms, tell your doctor about them. Moreover, in some cases, pale nails can be a sign of serious conditions such as liver disease, congestive heart failure, and malnutrition. Many people bite their nails and the skin around them; and while the habit is unhealthy and unhygienic, it’s not life-threatening. 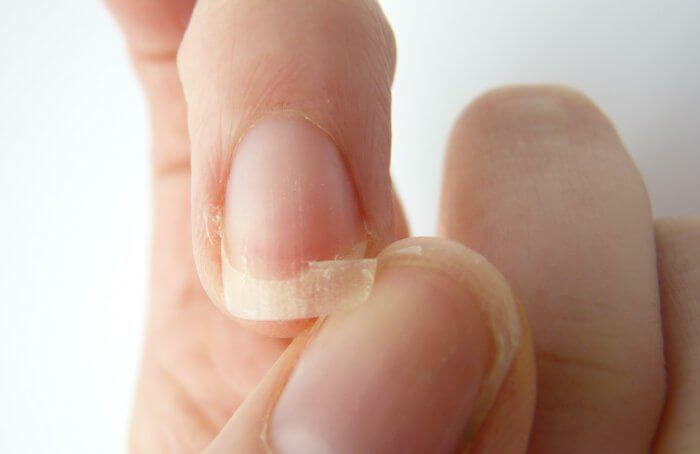 However, a constant need to bite our nails and cuticles may be a sign of anxiety or obsessive-compulsive disorder. If we are having trouble controlling ourselves, we should talk to a professional. Alternatively, we can try a bitter-tasting nail coating. Many patients who have psoriasis face these symptoms. So, if we are experiencing pitting or our nails are covered in dents, we should talk to our doctor. Previous How to Prevent the Common Diseases of White Collar Workers?